One of the best parts of social media is that it gives you another outlet to add value to your relationships through the posts you create. Social media allows you to shape the perception of your company to your network and form different ties to connections through these different platforms. However, to effectively communicate on each social media network you must make strategic adjustment to ensure your posts get noticed. Think about it this way, when you are talking on the phone, texting, and/or writing an email do you employ the same communication patterns across each? Probably not and this answer would hold true for the various social media platforms. What are the best ways you can communicate across each? Facebook gives you a causal environment to relate to your network. You don’t need to use a professional tone, and can provide some fun tidbits about your company, such as birthdays, office events, and new product features. To gain the trust of your network, prove to them that you are more than just a business: show them the culture of your office and some of the daily activities. You can also build trust by posting about charitable events or foundations your organization supports. Trust in your organization makes people want to buy your product and become repeat customers. Facebook captures the largest amount of people online, with a projected 1.43 billion users in 2015. 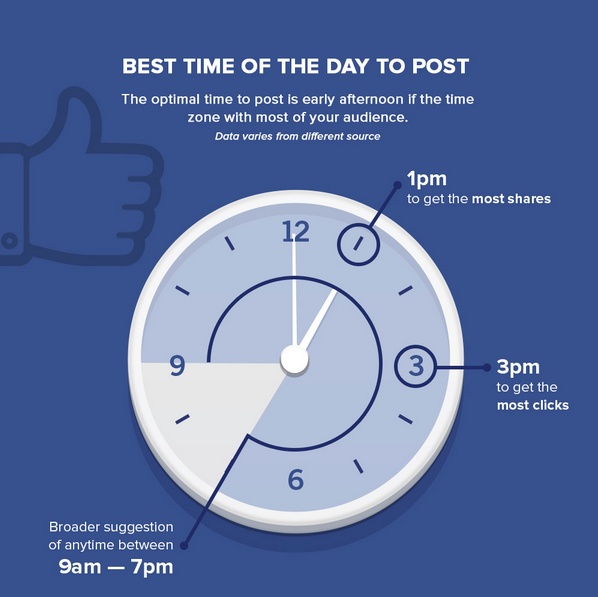 To optimize your reach on Facebook, the best days to post are Thursday and Friday. If you aim to get more shares of your content then post at 1, and post at 3 for more clicks. Most people check their Facebook account at lunchtime as well as after work. To get noticed post a little before these times to get your content on your contact’s walls. Even though this platform is more informal and relaxed, it is important to avoid being obnoxious with excessive posts. Post once approximately every other day to get your message across but not be overbearing. One issue you might come across with Facebook is posts appear on timelines based on time, popularity, and interaction. So while timing is important, you cannot guarantee your post will appear on your network’s timeline. Twitter is best used for short posts and quick updates. This platform can help you increase traffic to your site and makes communication with your contacts quick and easy. Frequent posting increases your visibility on people’s timelines because of the constantly updating stream of Tweets. Depending on what type of business you run, the best days of the week for tweeting vary. For a B2B company, engagement is 14% higher Monday to Friday. B2C companies have a 17% higher engagement rate on Wednesday and the weekend. Twitter users are most likely to log on to Twitter during their commutes to and from work. Twitter timelines fill constantly with new tweets since they appear in chronological order, so to get noticed you want to tweet when your followers are online. Catch the commuters when they are most likely to interact: 5 pm had the highest amount of retweets, while noon and 6 pm had the highest amounts of clicks. 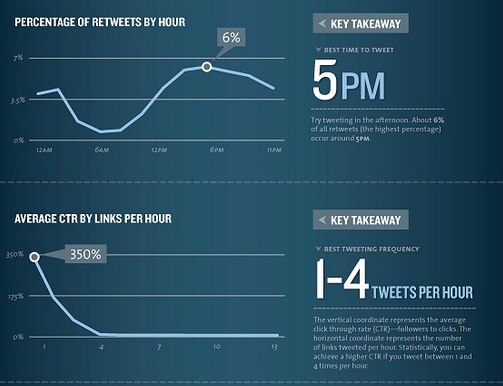 To get the most out of your Twitter account with your followers, tweet between 1-4 times an hour. With this amount of frequency you can make sure you appear multiple times on the timelines of your followers. 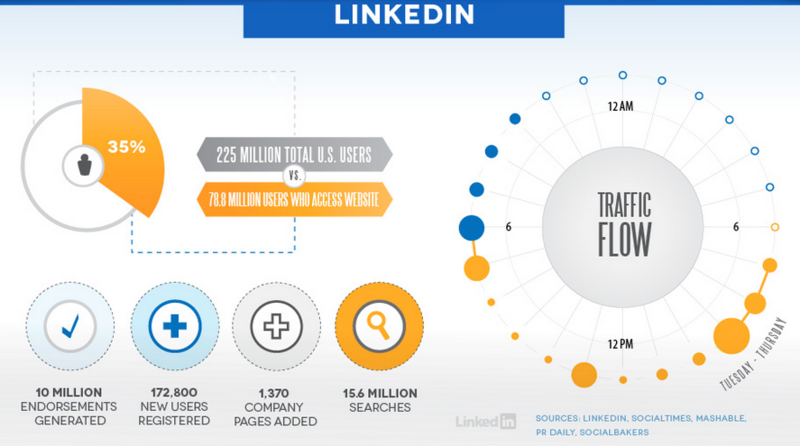 If you are looking for the best B2B social media platform, then look no further. This platform provides a more formal business setting to network with other businesses, potential hires, and future clients. It is a great place to communicate about how your company is improving upon your product, share interesting information with other business people, or notify the world if you have a recent change in jobs. This site is not the place to be posting pictures of your new puppy, but it is a great place to develop new connections and network with people who have similar professional interests. The best times to post on this platform is during the workweek, specifically midweek during typical work hours. To get the most shares and clicks on your posts, put them up on Tuesday between 10-11 am. On the other days, you should post between 7 and 8 am, and avoid posting between 5-6 pm, giving you time to focus on your Twitter. Quora is a question and answer style format. To gain influence on the site you answer questions in a meaningful way, or post good questions. You can focus on questions in your industry, or even more specifically questions about your product or services. Answer questions you know a lot about in order to be up voted to gain visibility. With Quora you run into the same issue as Facebook: your posts don’t necessarily show up in the order they are posted. Quora notoriety depends more on quality over time, and to what you have set your interest settings. Getting your questions answered and getting noticed on Quora requires time and effort through good posts of both questions and answers. Google+ has a much smaller audience than the other platforms mentioned above. It can be used to maximize the visibility of a brand on Google sear pages. This is especially helpful for small businesses because it gives your business SEO value. Although the audience is smaller, you shouldn’t ignore Google+, many of the top brands have collected 90% as many fans on Google+ as they had on Twitter. Google+ can generate as much engagement as Facebook, and as much as two times as much engagement on Twitter. To best engage with your Google+ fans, post weekdays in the mid morning, between 9-11 am. Getting a better SEO value on Google can be done through adding a +1 button on your site to encourage greater shares. No matter what platform you use, remember it is best to connect with contacts soon after you meet them to stay relevant and fresh in their minds. You don’t need to connect with everyone you encounter. Add people who you made worthwhile connections with or expect to build a relationship. Social media is a great way to personalize your follow-ups and network with a broad range of people. Personalization is key on social media. Even though you are marketing to a large group, social media posts make customers and contacts feel like they are dealing with another person rather than a large overbearing business.